My sons got me an external keyboard for my ipad which is great and not so great. Great because it is almost 11 a.m. and I am still in bed working on my blog and not so great …well not so great for the very same reason (I have other things I should be doing!). I found this fascinating Facebook post by Ron English that I just had to share, especially since it involves something that nearly everyone has around the house. I’m talking about that blue and yellow can of WD-40 tucked under the kitchen sink or out in the garage. I’ve only ever used it on squeaky hinges or getting the rust off things. Keep reading and you may just be rooting under your sink after this. 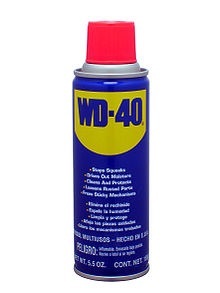 WD-40 or Water Displacement #40 as it is more officially called began as a search for a rust preventative solvent and degreaser to protect missile parts. It was created in 1953 by three technicians at the San Diego Rocket Chemical Company. The name originated from the project that was tasked with finding a water displacement compound. The formulation was finally successful on its fortieth attempt, hence the name WD-40. The Convair Company bought it in bulk to protect their atlas missile parts. Ken East (one of the original founders) says there is nothing in WD-40 that would hurt you. In fact, the main ingredient in WD-40 is simple fish oil. 2. Removes road tar, grime, and unwanted paint spray from cars without harming the finish. 4. Gives floors that just-waxed sheen without making them slippery. 5. Keeps flies off of cows, horses, and other farm animals.